Sold by CB-India (online store of Computer Bookshop (I) Pvt. Ltd.) (4.6 out of 5 stars | 134 ratings). Ships from and sold by CB-India (online store of Computer Bookshop (I) Pvt. Ltd.). Sold by Bookzone India and ships from Amazon Fulfillment. 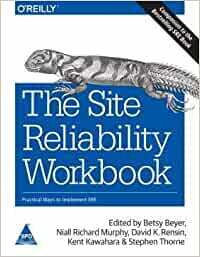 Start reading The Site Reliability Workbook on your Kindle in under a minute. Much more practical than SRE, examples are of great help as they give you confidence that you can use these SRE techniques in your startup or company. Really love reading all of it. My husband says, "it's a discipline that is interesting to a lot of sysadmin folks because we have to deal with the consequences of the old ways of doing things, so it's interesting to see how big companies deal with that in their day to day operations." Just got this book today with my colleague, haven't read it so far but my colleague told me that he was able to use the knowledge he learnt from the book(Chapter 5) to solve the problem he met at work.